Come stay in our cozy timber framed guesthouse for a peaceful, serene getaway away from the hustle and bustle of city living. 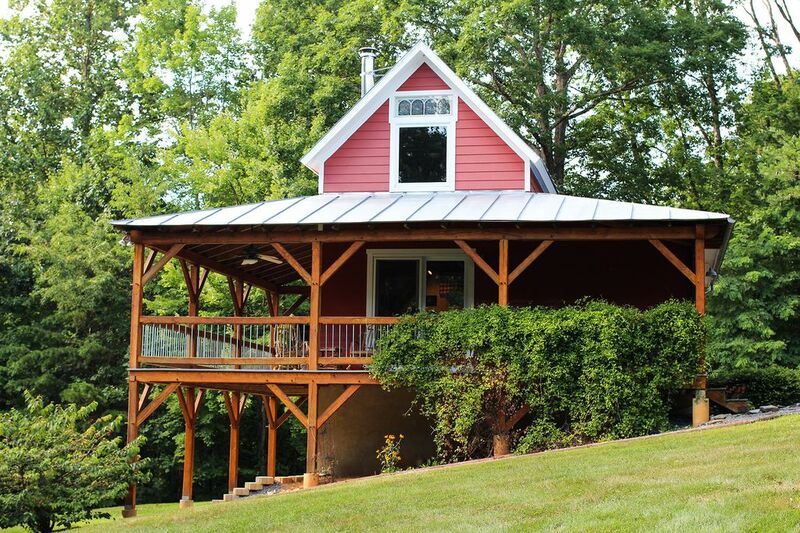 The cottage has a large porch that wraps around 2 sides. Two comfy rockers are ideal to enjoy the natural surroundings and abundant wildlife. There is also a small bistro table with 2 chairs so you can enjoy your breakfast out on the porch. We are located on 38 acres off a dirt road and are secluded, yet easily accessible to town. Lexington is a 12 minute drive and Goshen Pass is 15 minutes away for great fly-fishing and other outdoor recreational opportunities. If you are looking for quiet simplicity or a romantic getaway then this is the place. The living area has two leather recliners in front of a wood stove (firewood provided if you want to use the stove), a perfect setting for reading and conversation. We have books by local authors and a small collection of art by locals as well. The kitchen has a small refrigerator, stove, and microwave. There is a table and chairs for meals. The cupboard is stocked with dishes, silverware, glasses, coffee press pot, and a few other pots and pans. Heat and A/C are provided using a wall mounted unit that you control with a remote controller. The bedroom has a queen bed and the small bathroom has a shower stall, no tub. Linens and towels are provided. There is additional electric baseboard heat in the bedroom and bath. The loft has a small sofa, table, lamps, and chair. There is also a queen size air mattress for use by those over the age of 10. There are ceiling fans on the porch and in the living area and bedroom as well. There is a small washer and dryer for your use in the basement (outside access). There is no Wi-Fi, TV, or phone service to get in the way of your solitude, but your cell phone will work if you need it. My husband and I came to Lexington 25 years ago. He is a retired Civil Engineering professor at VMI and I am a self-employed bookkeeper. He is a VMI grad as well so this place is home. We love life in these mountains. So not the rat race of a big city. Slow pace of life. We share the peace and quiet with abundant wildlife. There are only 8 families that live on our dirt road so we have very little traffic. We see deer and turkeys on a regular basis. My husband spent a Christmas vacation painting me 4 barn quilts that are now on 3 of our buildings. They are so bright and pretty. We are 8 miles from the City of Lexington with 1 mile of that trip on a dirt road. House Mountain is visible from our property when the leaves are off the trees. Your cell phone should work, but there is no land line in the cottage. If you really have to check your email then you can use our internet. It is not too speedy as we live too far out for a DSL or fiber connection. Plenty of towels and washcloths. There is plenty of seasoned firewood for your use. Has the woodstove and 2 very comfy recliners. There is a small under the counter refrigerator in the cottage and a regular sized refrigerator in our garage a short distance away. The table has 2 pull out leafs to enlarge the surface. Extra chairs are in the basement if needed. There is also a small table with 2 chairs just outside the kitchen door for outdoor meals. We have large flower gardens and plenty of yard and woods to enjoy. We have a porch that wraps around 2 sides of the cottage with 2 nice rocking chairs and an end table. There is a small bistro table with 2 chairs if you want to eat outside on the porch. There are 3 steps from the driveway to the porch and one step into the guesthouse from the porch. Lots of peace and quiet! Couldn't have enjoyed our stay here more. Very private, quiet, and comfortable. Lots of great small touches like cookies and fresh flowers. The hiking and the beautiful vistas in this area are not to be missed. Thank you for accommodating us on such short notice, Cindy. We really enjoyed ourselves! So glad you found our little piece of heaven and that you had a good time. I recommend for anyone looking for a quiet retreat. Very well done and we will stay again. Very unique and very clean. Beautiful area. I stayed in the guest cottage and worked while my son was at the Goshen Boy Scout Reserve. It exceeded my expectations and made for peaceful week of work from the mountains--much better than the hustle and bustle of D.C. Cindy not only thinks of everything that a guest may want or need, she makes sure it's taken care of. This includes detailed directions, books on local hikes and outdoor activities, well organized kitchen, and many other details and amenities. The surroundings were lovely and I saw many deer and other wildlife, including a cute and curious raccoon one evening. I would stay there again without a second thought. Tip: If you're a hiker, Little and Big House Mountain(s) are closeby and a really nice and pretty rigorous hike. My husband and I have tried to make our guesthouse the sort of place we like to stay in while on vacation. Sounds like we have hit a home run with this guest. We enjoy the quiet and the wildlife too. An Absolutely Wonderful Place to Stay!! This is our 2nd time staying here and it is such a great place to relax in - we could for sure LIVE here!! It's private, clean, quiet - the wrap around porch is a perfect place for coffee, watch the birds, the stars, the rain - love it. The place itself is very well constructed, thoughtfully designed, well stocked (fresh flowers, fresh cookies too! ), in the midst of a beautiful setting - outside flowers & walkways - everything very well maintained. The owners live there on the property but it's still very private AND welcoming - Cindy is great! We've only been able to stay one night each time, but it would be the perfect place to stay longer - Shenandoah Valley is beautiful & this is a special retreat in the midst of it. We are so happy you appreciate our property. We work hard at making the place inviting and welcoming, just what we would want when we book our own stays. Close to VMI, W&L, VA Horse Center, Big Spring Farm wedding venue, Goshen Pass, Natural Bridge, and the Blue Ridge Parkway. Staunton is 30 minutes away. Charlottesville is 1 hour away. Roanoke is 1 hour away. All by interstate. We have added 4 barn quilts to some of our outbuildings.